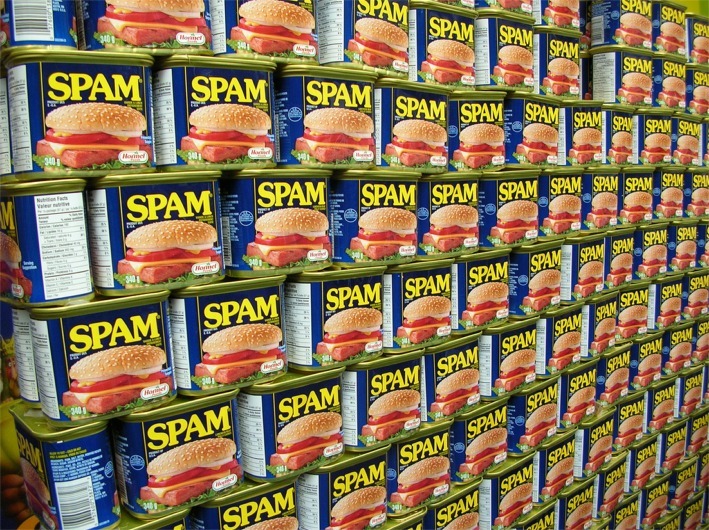 If there is one thing I don’t understand it is spam. Is it human food or dog food? Does it count as meat if it has vegetables (potatoes) in it? I understand spam comments on my blog even less. But sometimes you just have to admire the spambots that also enjoy irony. Now obviously I clicked on the link (not included) straight away and went to the blog, because, you know, who doesn’t love Kim Kardashian. On a related point: who is Kim Kardashian and why should I care? The post does ask some valid questions which I am more than willing to answer. Yes, I do get a lot of spam feedback/comments. This blog seems to get as many spam comments per month as the total lifetime legitimate comments. Or to put it another way: a lot. My main suggestion for people wanting to block spam from their blog is to make sure every post has to be approved, and after the blog has been running for a while, the spam filters and approvals become pretty efficient. The unasked question is: doesn’t that many spam comments annoy me? Well, no. Why would it? Sure, it would be annoying if my filter was less than 99% efficient, but ifs, buts and asses aren’t really causes for concern. And I’m sure that some legitimate comments are getting lost in the genuine Oakleys and real fake Armani spam ads, which is a reason to be annoyed. But overall, I see the huge bulk of spam comments to this blog to be an indicator, on some level, of success. I could be wrong here, but if this blog wasn’t doing reasonably well on searches and traffic, I’d suspect the spam would be much lower. Yeah, that’s the one I use. But most filters seem to do their job well once they have figured out who posts what. E.g. your post just needed approval, it didn’t get put in the maybe or spam piles. Probably helps that you didn’t mention discount sunglasses and designer fashions. Do you use Akismet, and does it seem to work well for you?